I’m still fussing with photos, but it’s basically finished. I will have to have a frame custom made as I can’t find a floater frame deep enough for this piece. 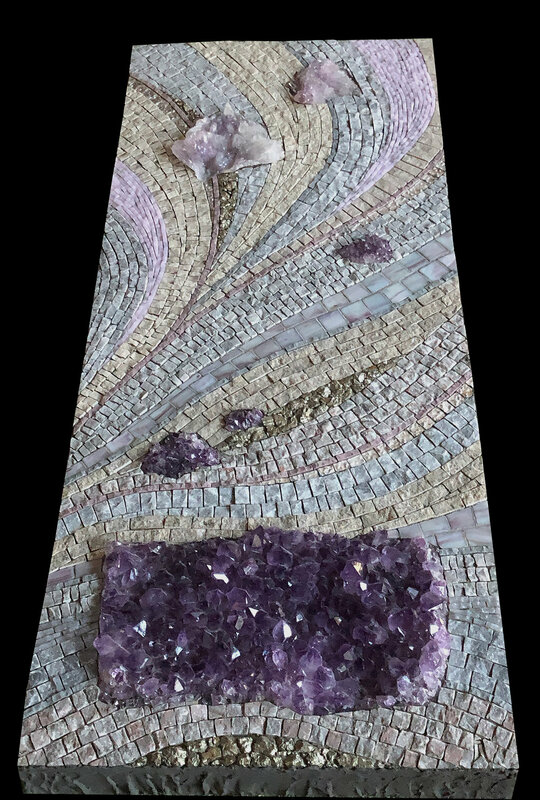 I Heard the Mountain Sing 30” x 12” Marble, amethyst specimens, pyrite, glass, porcelain, mosaic gold.. Digitally framed. I showed this to a friend and fellow mosaic artist and she said something to the effect of “I know it’s about mountains, but it looks like flowing water to me.” So, what’s with the title? I’ve already talked about how I found the big amethyst slab in a little shop in Zermatt, Switzerland, last fall. I had such a lovely time on that trip so, to me, that slab will always remind me of beautiful Zermatt. But more than just the amethyst, I wanted to express the way that mountains make me feel. I absolutely love the mountains, the way that some people love the ocean or the forest. When I see the mountains, they take me out of myself, they give me a sense of rising up and out—of expansiveness. I also sometimes feel this sense of expansiveness with certain music—I just want to open my arms wide and embrace all there is in the moment. It is a spiritual experience that connects me to something bigger than myself. The mountains sing to me in this way and open me up. This is what the title is about and also what I wanted to express in this mosaic’s andamento. I’ve tried several times to get a good full shot that shows more texture, but no luck yet. I was able to get the shot at the right with the mosaic on my work table.